"The technology was tested on 3 cylinder engines to 454 V8s with equal success. The calculations are 1.8 hp per cubic inch of displacement. Your 302 would produce 630 hp; a 350 equals 720 hp and that big 454 would kick out 817 hp! All this and it has a mild idle and is completely street able." That "Homogenizer" spinning brush looks a bit crazy ... wonder how much material broke off and got sucked into the motor? 2.3 in a Galaxy that out performed the 302 and doubled the mileage. Homogeniser wasn't spinning in any of the stuff I was looking at back in the day. Was just a way of providing better atomisation...I tried a "3 gasket" arrangement on a Holden 6, with Al flyscreen as a middle gasket between two fibre gaskets on a Holden 6....similar gaskets available for the main players in the states at the time. It worked, markedly well at idle and cruise...for a little while. Engine swallowed quite a bit of Al flyscreen with no issues. Look at the patents, 3.8 Buick, made 3 cylinder. Of possible interest, my college days at ERAU in Daytona Beach, Florida included a few years renting a house by the Beach, on North Peninsula road. Not particularly interesting, except that Smokey's "Best damm Garage in town" was almost right out my front door. I was there on a regular basis and got to know him fairly well. Mostly due to our crazy engine projects where we needed technical advice on hardening metals or some esoteric compatibility issue. As an engineering student, his ideas and his presentation of those ideas, were not only extremely unconventional, but really took some thought for a college kid to follow. I was quite used to blackboard/whiteboard/projector type presentations where one could visualize the goings on in, say, an air cycle machine. Smokey would blurt something out and let us think on it for a week or more. Looking back, he may have been hesitant to give away his secrets. Anyway, I did come to understand what he was doing from a basic thermodynamic point of view. It's much along the lines of what we do with smaller gas turbine engines that use a "recuperator" to take hot exhaust gases and heat the air just prior to combustion. For those who don't know, on gas turbine engines that have very hot exhaust and modest compressor discharge temperatures, a heat exchanger (recuperator) can add heat to the compressor discharge air. That heat then works in exactly the same way (but to a lesser extent) as combustion itself. It's not perpetual motion haha, although to some it may seem so. It's simply a way of using less fuel to get the same combustion temperatures by preheating the air "in" (just before really) the combustion chamber. Last edited by Cujet; 02/07/19 09:59 AM. Smokey was concerned. In a period interview about the Fiero, he stopped to call his patent lawyer several times before giving limited answers. He knew he had something there. I heard the Fiero was sold at auction a few years ago. you lucky man....I got in trouble at a leadership live in a few years ago, when we had to answer which male role model influenced us the most over our lives...I answered Smokey, and was apparently wrong...so I defended my position, and they accepted it after a while. Back in the '90s, I had an HZ Holden Wagon, with 253 V-8...it was 15-18 MPG max (Oz MPG too, not US)..
* The thermostatic inlet air controller on the air cleaner was bridged, so that at idle it was ALL hot air (WOT it was ducted cold). * I routed the PCV through a coil wrapped around the Right hand exhaust manifold, and back to the carb...wrapped the coil in ceramic blanket to heat the PCV to the max...the PCV port on the Q-Jet aimed straight at the idle mixture ports, so my intent was to heat the idle/off idle/transition and cruise. * Added EGR extension tubes to point exhaust gasses at the same point, from the opposite side of the throttle butterfly. * drilled the EGR valve to introduce EGR at idle...functioned as a normal egr otherwise (tried full EGR at idle, and was too unstable, surving manifold vacuum. * restricted on of the dual exhausts (full dual exhaust), to force more heat under the heated plenum. * Ran full vacuum advance at Idle. * as a result of the above, I ran out of bottom stop on the idle speed setting, and had to control idle speed with idle mxture...it would run way way lean. * as a result could stick fuse wire in the primary jets to lean them out. * and richened up the secondary metering rods. HOT HOT HOT...but at W.O.T. all the vacuum stuff had no vacuum, so it was cold air, minimal EGR (remember the valve was drilled), and back to mechanical advance. It didn't ping at all. And it got 30MPG on the open highway. But was an absolute DOG to start and keep running for the first 3/4 mile or so. Did similar on a couple of simple pushrod 4s and 6s with similar results. I've done the thermos, and there's enough waste heat in an engine to catalytically crack the fuel in the "water gas" process to hydrogen and CO (syngas)….I've drawn it up a few times, but it's pretty dead with Atkinson, VVT, GDI, turbos etc. and diesel like compressions on gassers. I remember picking up a book he wrote on automotive maintenance. It was kind of weird. I remember it said that he thought that the ideal motor oil would be a "polyester oil" and that it essentially would never need to be replaced as long as it was properly filtered and topped off when low. His book also recommended a "polyester 5W-30" as the ideal racing oil (I guess excepting drag racing). Not sure he would have the same opinion today, but he certainly had a lot of opinions. And yeah my kid loved watching Cars 3 and has looked up all sorts of things behind the inspiration for the characters. I wonder if their Smokey would have been too obvious if they gave him a cowboy hat. And wasn't he a notorious cheater? Smokey's shop, "Best damm garage in town" was a fun place for us to visit. It really wasn't clean like you might expect at a high end place today, and the projects he worked on were not made with "eye candy" CNC precision. The projects were all built by hand, hammered out by those with old world skills and a true understanding of what is necessary and what is not. Absolutely nothing in his shop would be considered normal now. 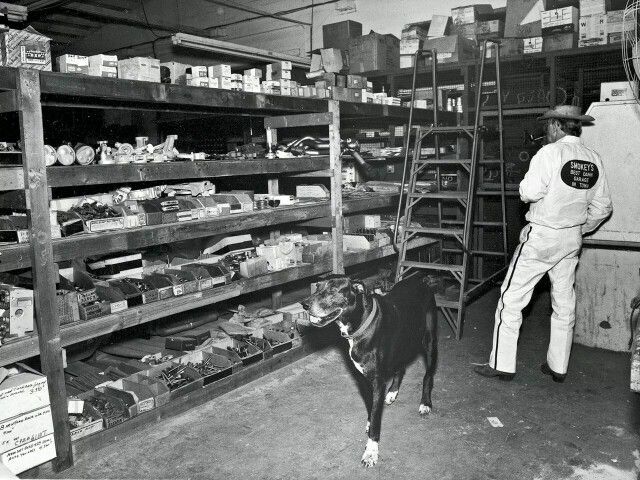 It was not unusual to see various old parts on shelves which were remnants of past experiments. And maybe kick a few on the floor too while winding your way inside. Don't take this the wrong way, it was always very interesting, and cool things were happening all the time. The shop was right on the river, (intracoastal waterway) and not exactly in the high end part of town.... It was humid, hot, sticky, but smelled and sounded like heaven. From my end, he generally provided advice. One project we had involved a Ford 302 V8 with 12.5 to 1 compression and something like 0.625 inches valve lift along with absurd duration. We kept breaking rocker studs around 8000 RPM and needed help getting the heads to hold up. He advised us on how to make that work. The off the shelf products like the "Moroso" screw in studs were just not strong enough. In the end, we adapted something much bigger (uhhh from his Chevy stuff) and had good results. He worked with us machining and hardening some metal spacers that were exhibiting high rates of wear. 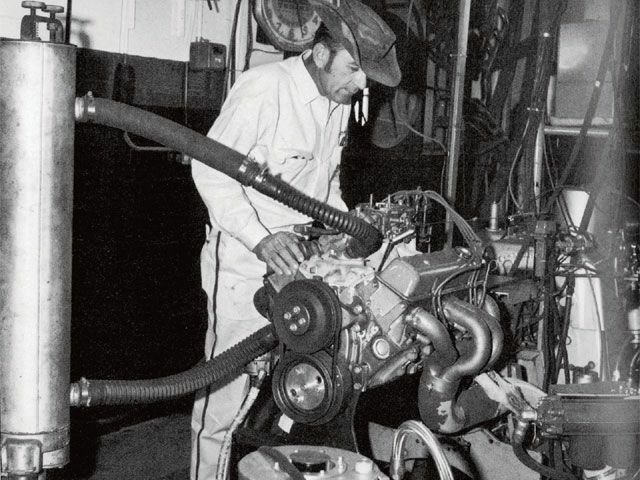 At the time, he was doing Chevy stuff and 700-800HP was not uncommon. Our lowly Ford was probably lucky if it approached 400HP. Today, we take it for granted that slipper skirt pistons, piston pin offset and connecting rod lengths are optimized and in common use. Back then, few people knew about these things and Smokey did push the limits with his designs, mostly through trial and error. Last edited by Cujet; 02/08/19 09:35 AM. Hmm, lost a post in here somehow. It's in the Don Garlitts museum. 1995 K3500 cclb 6.5 turbo diesel running whatever 15w40 is on sale. He didnt cheat; he found loopholes in NASCAR's rulebook. Not sure what they're describing in the article, but makes it sound like a spinning device to atomize the fuel. Maybe that photo they show calling it the "homogenizer" is some other earlier design.
" He designed a new cam; a homogenizer (exhaust driven turbine) to mix the air and fuel and a new intake manifold that is totally wrapped by exhaust gas ducting (to heat the mixture)." "The turbocharger-like device is actually a homogenizer and the second-stage vapor generator. In the homogenizer an exhaust-driven turbine drives what appears to be a rotary compressor totally wrapped with exhaust gas ducting. The homogenizer serves to mix the incoming air and fuel into one uniform, homogenous mixture with the surrounding exhaust gases further elevate the mixture temperature to about 285 degrees F."
The homogeniser WAS a turbocharger, not the toilet brush. He had to get volumetric efficiency back after/during adding all that heat.